This limited time opportunity will have a food, drink, and dessert menu. 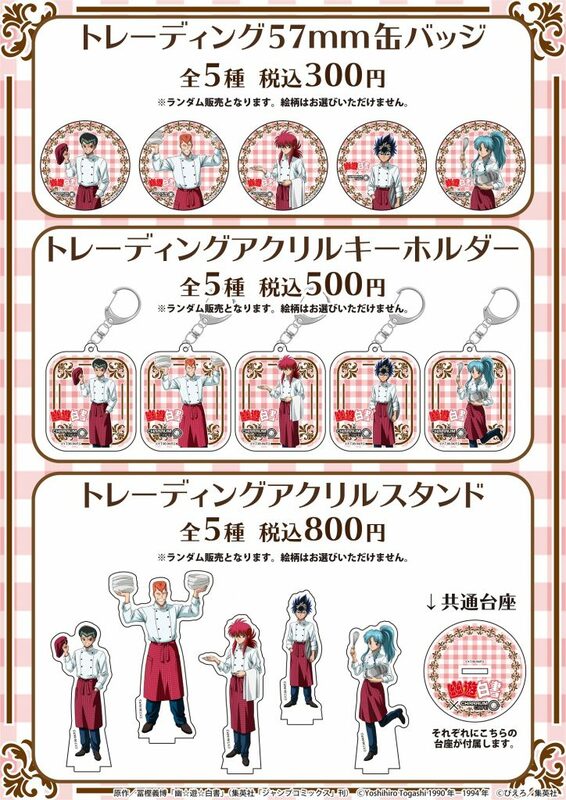 Novelty items will be given out for ordering from the menu’s as well as special Yu Yu Hakusho goods to be purchased from the café shop. If you’re a fan of the series and find yourself in Ikebukuro wanting a quick snack, this café will be perfect for you. Charaum café accepts advance reservations free of charge but requires signing up for a basic account with their website prior to reserving. In the event that they’re not busy, you can enter the café without a reservation. Special bromides will be handed out at random as novelty per order while supplies last. There are 13 possible designs in all. Original goods will only be available to be purchased by customers who visited the café.